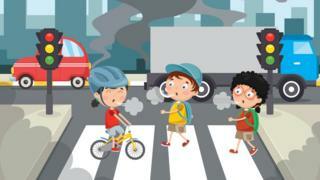 Air pollution and road safety: Should schools close their roads to traffic? Forty schools around the UK closed their roads to traffic this week. It's all part of a campaign by the charity Sustrans called the Big Pedal Challenge. The challenge aims to encourage more young people to cycle, walk and scoot to school and will see more than 2,200 schools taking part. As part of the special day, some schools went further and closed their roads to traffic. Quiz: How much do you know about the world's pollution? It's to help make children feel safer playing out and riding bikes and is also an effort to try to cut pollution. Experts say adults leaving car engines running when you are dropped at school causes too many fumes to be released into the air which can damage lungs. So do you think it's a good idea to stop cars going so close to schools? Take part in our vote and leave us a comment below. It's quite a good idea, but the people who live far away from said school will have to drive (maybe a drop off point would work). Maybe they could have a drop off zone further away from the school or they could get a bus? It is a good idea but some people live too faraway to walk,scoot or ride and so their only option is to drive. How are these people going to get to school! ?